There is much talk about the value of after school clubs with the socialising and skills that children learn during them. Some schools provide a great deal of choice and others less so. If you cannot afford the cost or time of running your children around to a massive range of activities but still want ideas on how to entertain them, then try some from the list below. If you have a local park then going there after school can be a lot of fun for the children. It will be free and they will get some exercise while they are there as well. In dry weather they can play on the equipment but if the ground is wet then you can just enjoy having a walk. You can give them items to spy for while you walk or sing and dance while you do so. It can be a great break for a parent too, sending their children running around and hunting for things. A larger park may also have flower beds to look at grassy areas where you could play football or other ball games. You could arrange to meet friends too, who have children so that the children can all play together and perhaps even make it a regular weekly event. The library can be a great place to go, particularly if the weather is wet. Often there are activities for children to do, but just learning to go and choose books, borrowing then and knowing how library’s work can be really valuable. They may need particular books for their homework anyway that they need to choose or just want some stories to read. You could also choose some books for bedtime stories. On dry days, playing in the garden can be a lot of fun. 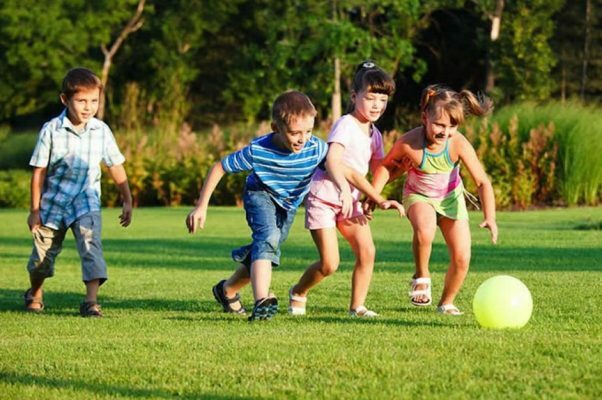 These days children seem to play outside less, but if you go with them and show them the types of games that you would have played outside as a child then they will soon be having fun. Being outdoors should take them away from computers, television and games consoles and just give them something different to do. Although electronics have their place and give children something to talk to their friends about, expanding their play will give them things to talk to their grandparents about as they are not normally interested in the latest computer games. Most swimming pools have lessons that you can book children in to in order to teach them to swim. This can be a valuable skill, but could be expensive. It could be cheaper for you to go swimming with them and teach them yourself. You will all also have fun together and keep fit too. It is worth investigating the costs of going to decide which might be the best option for your family. It can be a lovely treat after school to take your children to a café or out for afternoon tea. Having a hot chocolate and a cake can make them feel so grown up and they will also really enjoy having a special treat. As long as no one gets out their mobile device, it can be a lovely opportunity for you to talk about what you did in your day. You could try out different places so that you get new experiences each time you go. After school clubs can be a cheap way for children to expand their hobbies. School run clubs tend to be extremely cheap and can span across many different things. They could learn valuable skills such as cookery, get some exercise in sports clubs or just have fun with friends. It is worth encouraging them to do some clubs so that they can meet children that are not in their class and try new things. There are also opportunities for children out of school to do things such as sports, drama or music. These can tend to be rather expensive and some may also have things to buy to take along or outfits they have to wear which cost even more. Some groups are cheaper than others and will give the children a broader range of skills, Brownies or scouts for example could come into this category as well as youth clubs. It can fun having craft time with the children after school. Doing crafts at home together can be a really nice way to spend time together and all relax. You may have skills that you can pass on, such as knitting or sewing or you may decide to do art. It could be that you all learn new skills together. Cookery is a skill which your children will need to have eventually. It can be really good if you spend some time each week teaching them how to cook. Everything from how to plan a meal, the cost of the ingredients, how to prepare them and actually cooking the meal can be taught. Children love eating things that they cook themselves and so it can be a good way to get them to try new things. You can also get them cooking their own evening meal which can be useful and fun. Having friends over after school is a really great way to improve their confidence and social skills. Children love to be able to show off their house and the things that they have and just enjoy extra time with their friends. It can give the parent a break for a while from entertaining the children as well. They may also get asked back to their friend’s house and that will give them a new experience as well. Making cards with the children can be really useful. If they draw various designs on cards and colour them in, then you will have a stack of cards ready for when they need to write thank you cards or send birthday cards or letters. If it is coming up to Christmas then you can obviously do Christmas ones instead. Making cards can be a lot cheaper than buying them as well and many people really appreciate the effort that goes into handmade items, particularly if it is obvious that they have spent a lot of time doing it. These activities are a great way to explore where you live more and keep fit at the same time. If you do not walk home from school then it can be a great way of getting some exercise as well. If the children are not keen then you can find things to make it more fun for them. Make it into a treasure hunt or play eye spy items. You could go somewhere where there is a treat at the end such as some ducks to watch, a shop to buy a treat in or a friend to meet. Alternatively they could use scooters or skate boards if they prefer. Pond dipping can be a really great educational activity. If you live near a river or canal then you can easily do this or in your local park if it has a pond. Take a net and bucket and you can learn a lot of new things particularly if you use your mobile device to identify things or find a book about it. If you do not like the idea of taking things out of the water, you can just look for them from the side. You may be able to spot fish, newts and ducks as well as other birds and insects. You will be able to see different things at different times of the year. After school can be a good time for visiting relatives that live nearby. If the children have cousins to play with then it can be a lot of fun for them but can also be good for them to chat to other family members too. Even if you just stay for an hour it can be a free activity which keeps them entertained in a different way than they would be at home. If you have a local museum then it is likely that it will be free or very cheap. This means that if you visit it just for a small amount of time, it will still provide really good value for money. Most museums have specific activity sheets that children can do which will help them to interact with the exhibits and learn from them. They are great places to visit when the weather is not good and you will often find that you will see new things each time that you visit. Many towns have signed trails that you can do to learn more about the buildings and history of the town. You can also get trails online that will help you to explore places in more detail. It can be fun learning more about the town that you live in, even if you have always lived there you may learn new things. You could also visit local towns and learn about them as well. If there are no trails then you could spend some time as a family looking at the buildings and then researching them and the town history when you get home. There are ways that you can make household chores and gardening fun for children. Having helpers can sometimes feel like it is more trouble than it is worth, but they do need to learn how to do these things. Giving them seeds to plant after they have weeded can help to get them excited about gardening. Finding them household chores that they enjoy can make things more fun, most children enjoy cleaning mirrors and windows so they could do that as a treat after they have cleaned their rooms. Making something of their own can be very rewarding for children and a great way to learn. Whether they decide to film a video, write a story, make up a song, write an app or something else. These enterprising activities could not only prepare them for the sort of job they may like to have when they are older but also earn them income now if they want to. They will also get a lot of fun out of it. As children get older then teaching them compassion can be an important part of their education. Doing volunteer work can show them a way that they can help others. There are many things that they could do such as helping out at food banks, giving out leaflets etc. There will be age restrictions on some activities though. You could get them involved with the school PTA perhaps helping with fund raising ideas or helping out on stalls at the fete etc. As they get older, this sort of thing will look really good on their CV too. It is rather old fashioned these days to play card games or board games. However, there is something fun about being able to play altogether as a family and have fun together. You can also teach your children skills which they may not otherwise learn. Card games can be a great way to improve their maths and many board games can be educational too. Despite the fact that most children prefer computer games, there is still a good range of board games on the market.